I freely admit to being a geek. 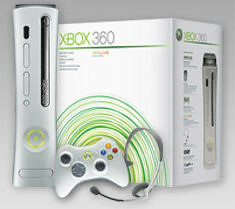 Which is why I can freely admit to being excited that the new Xbox is coming out in exactly one week. I managed to pre-order one from Futureshop, after a late night of drinking and coming home to realize that they put 10 up for sale every night at three o' clock. So hopefully I will have one on my hands next Tuesday, and I will surely share my impressions on here for anyone who cares. The only problem is that my dinky 27 inch TV will no long cut it. Tiny tiny 27 inch non-high-definition televisions are so 2004. So I've been looking into big screen TVs which I can't afford. Amazingly, even V seems to be into buying one. Oh, and speaking of amazing technology, I just got a new paint program. 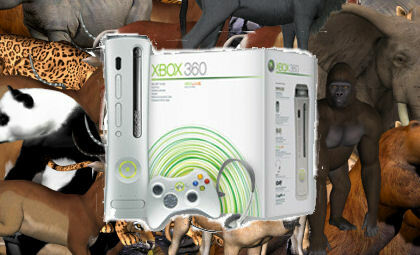 So now I can do stuff like take the picture of the Xbox 360 there, and put zoo animals in the background. Yeah, I figured it was better to preorder while I could (i.e. during the 5 minutes after 3am when they were available) rather than realize I want one later, then having to wait until the new year. I have a feeling that Microsoft (and every other game company) purposefully limits the number of systems they produce, so that they can't possible keep up with demand. Ironically, this probably increases demand even more. People see lineups on the news, hear about systems selling for $1000 on Ebay, have their fathers murdered in a stampede when a shipment comes in right before Christmas, etc., and they just need to have this little white box that everyone will do anything for. EVEN KILL. And thanks for the comments, dude. I have the hunger problem too. I might have to get rid of those pictures and change the colours to puke green and orange, just to stop this site from contributing to my ever-increasing chocolate gut.